Meteosat is the European geostationary meteorological satellite system the first of which, designated Meteosat-1, was launched in 1977. 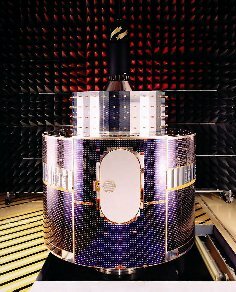 The final satellite in this series, Meteosat-7, was launched on 2nd September 1997. Since then threeMeteosat Second Generation satellites have been launched MSG-1 in August 2002, MSG-2 in September 2005 and MSG-3 in July 2012. MSG-1 is now Meteosat-8, now in standby mode as a backup, and MSG-2 is Meteosat-9, providing Rapid Scan Service with MSG-3 as Meteosat 10 providing the primary service see here. The first generation Meteosat system carried two image downlink channels, HRI (digital) PDUS on 1694.5 MHz and analogue WEFAX on 1691 MHz. WEFAX was also transmitted at specified times on the 1694.5 MHz channel. Raw image data was transmitted from the satellite to EUMETSAT in Darmstadt in Germany where it was processed and sent back to the satellite for re-broadcast to end users via the above frequencies. WEFAX sevices are no longer available from Meteosat. The globe was scanned every half an hour in three spectral channels, visible light – VIS, Infrared – IR and water vapour – WV, at a maximum resolution of 2.5 km (HRI VIS) at the Sub Satellite Point – directly below the satellite. Resolution falls off the further away from this point due to distance and the curvature of the Earth. There is currently one such Meteosat operating. Stationed at 57�E is the primary IODC (Indian Ocean Coverage)satellite) transmitting PDUS HRI imaging in three spectral channels. This area would normally be covered by a Russian GOMS satellite at 76� E.
Launched in 1991, was retired in 2007 and booted into a graveyard orbit. The Meteosat system has served Europe, the Atlantic and Africa for 30 years now and the Indian Ocean region for many years and, due to the failure an American GOES E satellite, Meteosat-3 was moved to 50� W during 1991 and operated the GOES E service area imaging of the western Atlantic and the Americas for quite a time. Click HERE for sample Meteosat images.